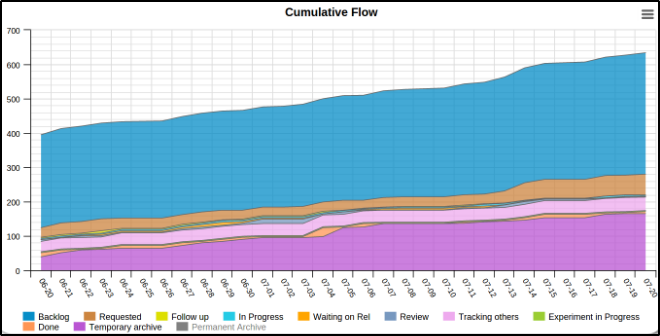 The Cumulative Flow Diagram (CDF) is a fundamental diagram and one of the most advanced analytics techniques in the Kanban world. The aim of the Cumulative Flow is to show the stability of your process over time. In other words, it helps Project Managers to analyze, just at a glance, how healthy their process is. The CFD tracks and accumulates each task that has ever entered or progressed to any stage of your workflow. Whenever you complete a task, the number of cards in your process' done/archive stages will rise permanently (as they are the last stages in the flow). CFD: The X-axis is a representation of a progression of time (can be configured to show time in: days, weeks, months, years). The Y-axis is a cumulative count of items in the process. The Cumulative Flow is on a board level and the diagram reflects the current state of the workflow. Every stage of the process (workflow) is represented by a differently colored band. The values are stacked, starting from archived cards at the bottom to the backlog at the top. Throughput is the average number of items processed per time unit i.e how many cards pass through a column per day/week/etc. In order to determine whether a process is stable, we need to monitor how the chart progresses in time. The simple rule here is to keep the bands as thin as possible. If the distance between the arrival and departure lines grows in parallel, then most likely we've got nothing to worry about. However, if it starts to expand rapidly, then tasks are arriving faster than they can be processed and we need to take immediate actions. How to configure Flows Charts in Kanbanize? The left side of the panel allows users to filter their data. You can define the range of time you would like to focus on. 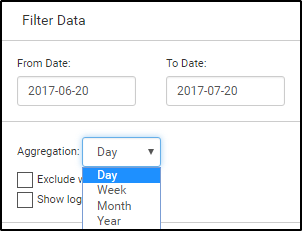 The module allows you to aggregate your data on daily, weekly, monthly, annual basis, depending on your project scale and you have the option to exclude weekends. 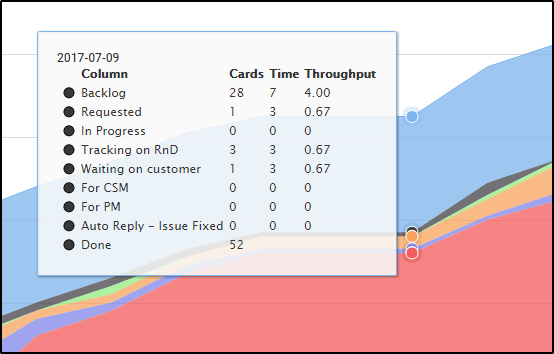 The panel allows you to generate "Flows" diagram for the different type of collected data such as: number of cards, cycle time, block time, logged time and size. In addition, if you have created and added a numeric custom field (e.g. cost), you can monitor its life in the flow. In practice, if you're tracking the cost of a project, you can easily spot where most money has been invested/lost, etc. In case that you decide to monitor the Cycle time of the cards, the panel will activate an extra menu, where you will be able to set up your calculations for working hours only -> use the time picker menus to define it. Via the Advanced filter, you can narrow down your analysis to a specific card or to a group of cards that match certain criteria (e.g. priority is critical). The panel also allows you to select what you'd like the Flows Chart to measure. Use the checkbox to indicate which columns to be included. 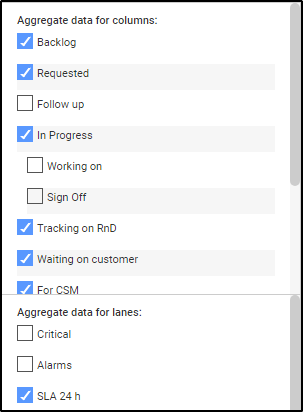 The settings of a particular Flows Chart generation will bе preserved automatically so you don’t have to configure the same search every time you enter the Flows tab in Analytics. Handy if you have a routine check! If you want to keep the results generated using your data filters for a report, click the Download button on the bottom right of the chart.